Today, Acute Laminitis is no longer a death sentence for a horse! to our clinic for horses with hoof diseases where we are happy to provide immediate assistance and relief for your horse! We specialize in the rehabilitation of horses with Acute or Chronic Laminitis. We have many years of experience in emergency and intensive care of horses with Acute Laminitis. Cryotherapy now permits the quickest, most effective and enduring rehabilitation for horses with this condition. We are one of few teams in Switzerland who offer Cryotherapy and intensive care for horses with Acute Laminitis. On the basis of our past experiences, Cryotherapy generally stabilizes Acute Laminitis within 12 to 48 hours. Cryotherapy is accompanied with pain relievers and anti-inflammatory medicines which help further alleviate the symptoms. In a second phase, the medication is reduced step by step. During this crucial period, our team ensures around-the-clock observation and care for horses suffering from this condition. Laminitis is defined as a disorder of the microcirculation in the blood supply of the hoof dermis. The hoof dermis’ structure is weakened to such an extent, that the coffin bone loses its stability within the horn capsule which results in sinking/rotation of the coffin bone. Warning: Laminitis is a life-threatening condition for horses and immediate care is necessary. Often horse owners tell us they feel over-challenged and helpless when their horse is diagnosed with Laminitis. The next step is to usually search the internet only to find different advice which doesn’t really help in making a decision. We have therefore been asked to publish an emergency procedure giving advice on how to handle the situation and explaining what exactly happens during an acute stage of Laminitis. 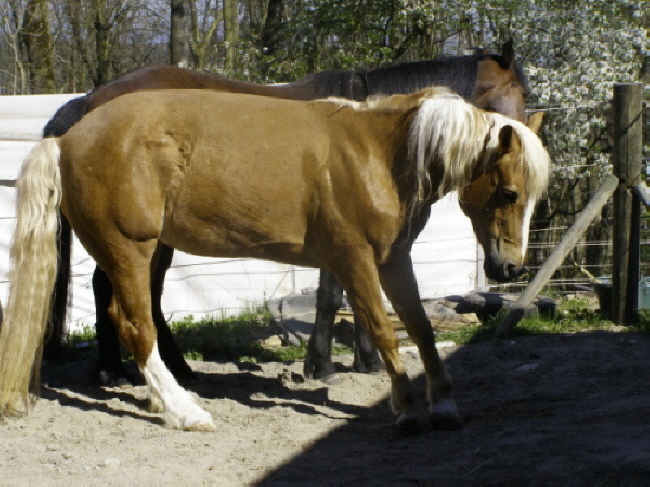 As soon as the horse owner notices irregularities with his/her horse such as “my horse is moving badly”, “my horse is tense”, “my horse walks as if standing on a hot plate”, “my horse is apathetic” or “my horse is different and agitated”, an experienced horse vet should be consulted immediately in all such cases. As a first measure, the vet will generally prescribe an anti-inflammatory/pain reliever. In doing so, the hoof can fully be supplied with blood. Protect the coffin bone from any pressure of the ground by putting a 12 mm comfort-pad. Fix it to the horn capsule with claw-tape. Your horse will be grateful – especially as it prevents a deformation of the coffin bone’s tip. If necessary, the horse’s heels are raised. According to our experience, it facilitates standing for the horse since the deep flexor tendon is relieved. The tendon leads around the navicular bone to the tip of the coffin bone. 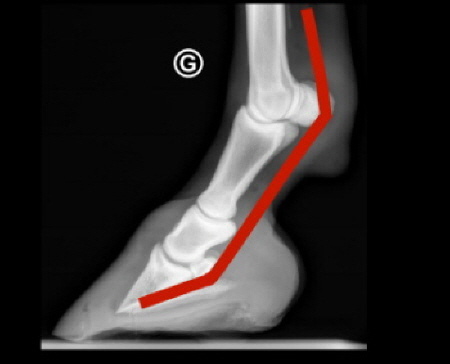 By raising the heels, traction on the deep flexor tendon is minimized and relieves pressure on the area around both the navicular bone and the podotrochlear region respectively. Thus, traction is also minimized for the coffin bone itself. By such means, the tip of the coffin bone is additionally not pulled to the floor. It is important that the horse does not stand for more than 14 days in that position as ligaments and tendons adapt and begin to contract. Bringing the heels down to their original position requires extreme caution. The procedure is similar to the method used with club feet. Please proceed with caution absolutely gradually and exceedingly slowly! Warning: If a horse is suffering from Acute Laminitis, the heels should not be shortened by any means. We have seen the effects of that procedure been conducted and it is devastating for the horse as it can stimulate the beginning of Ischaemia (ripping of the white line). Shortening of the heels creates further damage as it also contributes to the rotation of the coffin bone! The coffin bone will rotate or sink as long as there is a strong pulsation in the back of the pastern and if the horn capsule and the coronary region show elevated temperature. The afore mentioned studies (one of them is also available on our website) and our experience show, that by extreme cooling of the hoof (with ice that is at 2° C or less) the horse’s ordeal can be shortened significantly. Correspondingly, anti-inflammatories and pain relievers can also help reduce symptoms rapidly. Please note that cooling with cold water is not sufficient, since its temperature is normally at 6° C or higher. In case there is no ice available, cooling with water is still the better option than no cooling at all. Alternatively, the horse can be put in a bathtub especially build for Cryotherapy. We have built one of these bathtubs according to studies by Christopher Pollitt/Andrew van Epx (University of Queensland, Australia) which was launched in summer 2013. (We completely acknowledge the above mentioned studies which have aided us in our therapies). How can the owner contribute to his horse’s recovery? What needs to be done and what is the procedure? Caution: The back of the pastern should not be covered in ice. If your horse is prone to develop pastern dermatitis, the back of the pastern and the bulb need to be protected with Vaseline. Also please make sure not to use edged ice cubes. As soon as the ice has melted, the sock needs to be refilled with new ice. According to our experience, in such cases approximately every hour – day and night! It is extremely important that the cooling phase is not interrupted. Depending on the degree of the inflammation, 24 to 72 hours are needed. A long time – but definitely worth it! Please make sure to constantly check the pulsation in the back of the arch. 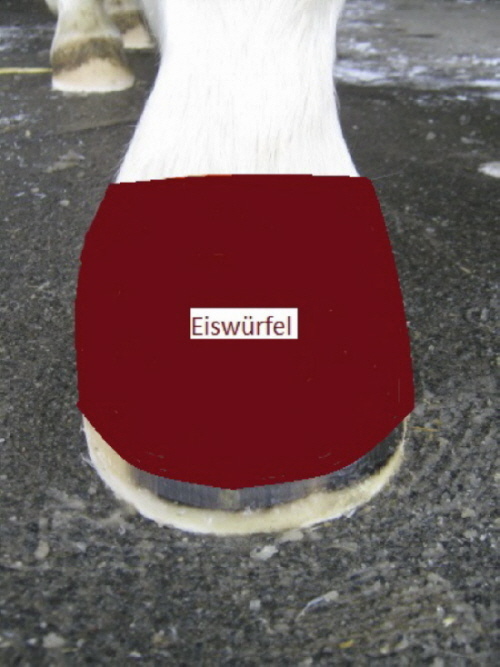 The pulsation will get weaker, the longer the hoof is cooled. The ice will melt slower as well and the intervals for refilling the ice will become less frequent. Caution is required when using hoof shoes. They should not impede the cooling process and they should not foster any heat generation. Again – the heat needs to be withdrawn from the hoof. It also goes without saying that no bandages should be put on the hoof. Do not use cooling-pads, since after a certain time they start warming up and create a contrary effect of what we are trying to achieve. For this reason, please use ice only. When there is no longer any strong pulsation, a huge improvement has been achieved! In general the horse will start to move around more on its own accord and show you that cooling is not pleasant any more. Reducing the medication is now the next step in this delicate process. Reduce the medication slowly and check the pulsation on a regular basis. Please consult also your vet when reducing the medication. He will give you the exact dosage of the pain relievers or anti-inflammatories. Continuing with the cooling process is still crucial though. Only when pulsation is normal and no medication is necessary is the battle won! Once this is achieved you have now stabilized your horse! Please feel free to contact us if you need help or require any further information. It would be our pleasure to be of any assistance to you and your horse regarding this matter.